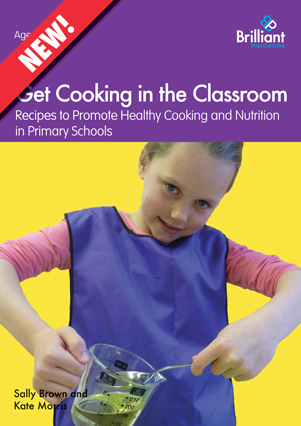 Cooking in primary schools is easy when you follow these 10 tips taken from Teaching Healthy Cooking and Nutrition in Primary Schools. Not only do the books in this series contain delicious recipes, they also help you to teach children about healthy eating and nutrition – essential life skills. Remind children that an important aspect of learning to cook is learning to work together. This is especially important if they are working in pairs or groups. Being able to share and work together is an important cooking skill. If you are working with children of mixed abilities, use both illustrated and traditional format recipes. Give less able readers illustrated step-by-step recipes so they can keep up with their classmates. Make sure the two recipes follow the same steps so the class can still work together. Demonstrate recipes 2-3 steps at a time. Introduce safety points as you progress. For example – remind children that they must always lay knives down flat and away from the edge of the table, whilst you demonstrate chopping. Encourage children to gather around all the ingredients and equipment they need before starting. They could tick things off on a copy of the recipe. If you place recipes and other sheets in clear plastic wallets (or laminate them) they can be used again and again. Use low-fat options where possible to encourage healthy eating. Show children the ‘Eatwell Guide’ to explain what types of food you should eat to have a healthy and balanced diet. You should eat five portions of fruit and vegetables a day and eat very little fats, oils and sweets. Whilst cooking, explain related theory to children. For example – when learning how to open a tin, you could explain that tin cans preserve food because they are airtight which stops micro-organisms getting in and growing on the food. After completing several different recipes and mastering different skills children could be given a Certificate of Achievement to acknowledge the accomplishments, such as learning to chop, knead dough, core an apple etc. Above all, have fun and enjoy cooking with children! 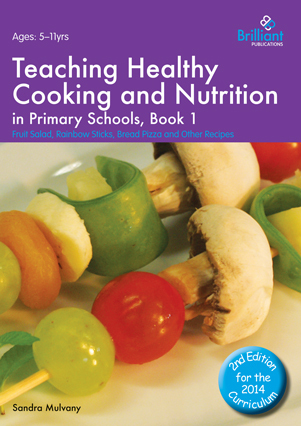 These ideas have been taken from the Teaching Healthy Cooking and Nutrition in Primary Schools series written by Sandra Mulvany. Each of the books contains twelve easy-to-follow photocopiable recipes, presented traditionally and in an illustrated step-by-step format. Once you know how to use two spoons to get your cookie or biscuit mixture onto a baking tray, it is easy to do. But what is the best way to teach children this essential cooking skill? Kate Morris and Sally Brown, authors of Get Cooking in the Classroom, have created a great video to help teach children the two-spoon method. Once you know how to cut ingredients safely using the bridge method, it is easy to do. But what is the best way to teach children this essential cooking skill? Kate Morris and Sally Brown, authors of Get Cooking in the Classroom, have created a great video to help teach children how to use the bridge method. Once you know how to cut ingredients safely using the claw method, it is easy to do. But what is the best way to teach children this essential cooking skill? Kate Morris and Sally Brown, authors of Get Cooking in the Classroom, have created a great video to help teach children how to use the claw method. Cooking with children is great fun – but have you thought of all the safety implications? Kate Morris and Sally Brown, authors of Get Cooking in the Classroom, have created a great video highlighting all the things you need to think about when cooking with children. This practical video contains great hints for ensuring that your cooking session goes smoothly and with maximum enjoyment! Once you know how to measure dry and wet ingredients, it is easy to do. But what is the best way to teach children these essential cooking skills? Kate Morris and Sally Brown, authors of Get Cooking in the Classroom, have created a great video to help teach children how to measure wet and dry ingredients. Children often find it difficult to use knives to cut food – but this shouldn’t stop them from learning to cook. Using scissors to chop food is a great alternative and much easier for younger children. Kate Morris and Sally Brown, authors of Get Cooking in the Classroom, have created a great video to help teach children how to chop food using scissors safely.